At Liberty Enterprises, we take pride in the products we design and sale, and we sell only the best of products that are backed by high quality and efficient service. 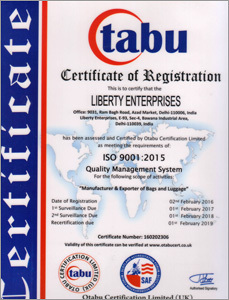 Since business establishment in 1989, we have been sustaining excellence marks as a premiere and trusted manufacturer, exporter, supplier, distributor, trader & importer of quality Hand Bags, Luggage Bags, School/College Bags, Beaded Bags, Fancy Bags, etc. All these products are designed in congruence with latest market trends and are offered at highly discounted prices. When you buy any of these products from us, we also assure you of genuine quality, ethical trade practices, timely product delivery and complete peace of mind. Hand Bags, Luggage Bags, Shopper bags, Beaded Bags, Industrial Bags, Toilet Bags, Promotional Bags, College Bags, Fancy Bags, School Bags, etc.